The other day someone asked me what I would do differently if I had it to do over again. I gave a few examples (the biggest being to get water and electricity up and running before you start construction), but I’d add a better soundproofing strategy to that list. In our case it’s mostly an issue between the two units, though we are a bit disappointed in how you can hear footsteps on the floor above you in our unit. We’re scrambling to try to come up with a better solution for between the two units. In hindsight it’s something we should have taken more time to consider during the planning phase. The main issue is that our living room is on top of our tenant’s bedroom. If we don’t take soundproofing seriously we’re going to have a very unhappy tenant every time we have people over for dinner or a party. 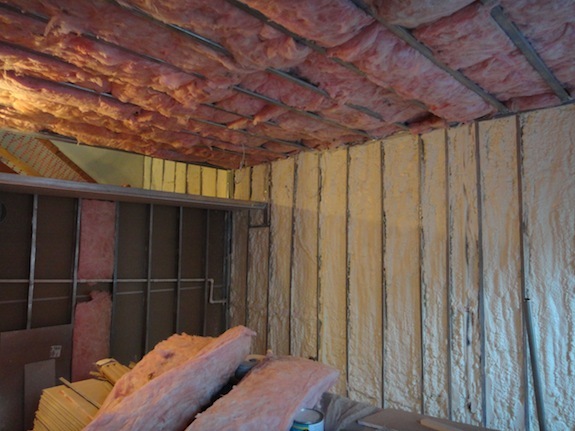 The first thing we did was an $800 change order to upgrade from fiberglass batt soundproofing to open cell foam soundproofing between the two units. I know there’s some debate about which is better. The fiberglass folks say fiberglass is better, the foam folks say foam is better. Fiberglass apparently has a better (or similar) STC rating (Sound Transmission Control), but open cell foam is supposed to be good at blocking mid-range frequencies like voices. But, that said, we’ve noticed you can still hear voices through the open cell foam – which worries us. Mind you, the ceiling/floor isn’t finished – it’s just a plywood floor subfloor plus the 5+ inches of foam at this point, but we figure we need to do more. You can also see all the open cell foam in the picture above. The channels screw into the joists on one side and then the sheetrock screws into the channels. Because the channels are just screwed on one side they bounce a little – that bounce is a good thing when it comes to sound. 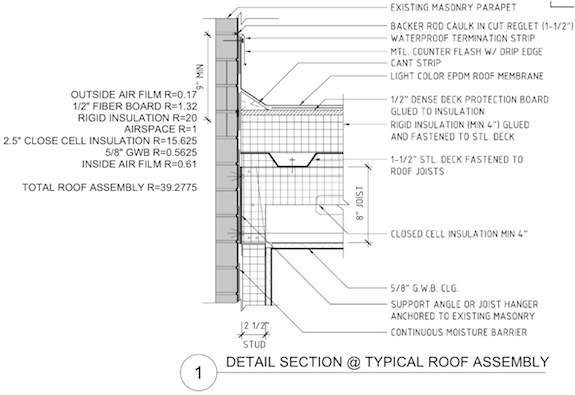 I’m pretty sure we need to put two layers of 5/8″ drywall on the ceiling since the ceiling has a 1 hour fire rating. So there will be more sound proofing foam between the layers of sheetrock and all the mass of the drywall will really help cut the sound as well. Two layers of 5/8″ drywall have gone in on the ceiling and things are MUCH quieter now. They still need to tape and do the wood floor, but so far voices and footsteps are significantly muffled – though still sorta audible. And the resilient channel does indeed help things. When I walk across the floor with heavy boots Dan could tell when I was over the section with channel. There’s still a little more to do (they missed a few walls – like the one in the picture below), but in general it looks great and it transforms the feeling of the house. Walking through the house is so different now – everything is just quieter and more muted and cozy. One issue which I thought of just at the right moment was the sound insulation between the rental unit and our unit. When I thought about sound I realized our living room is right above their bedroom. I mentioned it to the contractor who mentioned it to the insulation sub-contractor and an $800 change order later we went with 5″ of open cell foam in the ceiling between the two units. Open cell foam looks like closed cell foam, but it’s much softer – it feels like a fairly soft foam pillow. While closed cell foam is good at stopping thuddy sounds like someone walking overhead and the bass from a stereo, open cell foam is good over a broader range of sounds. Still, even with the open cell foam you can still hear people talking through the floor, but we still need to put the wood floor on and the ceiling below – that will improve things. 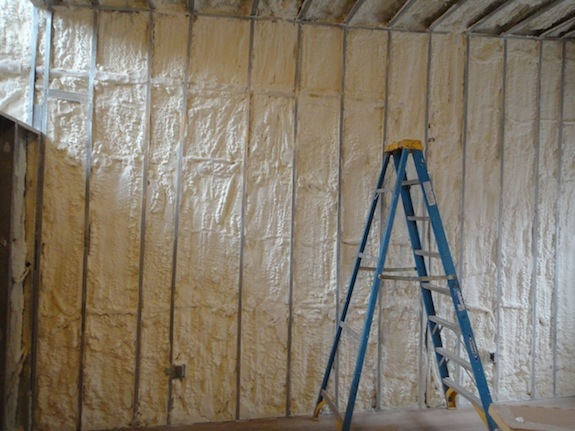 I’m temped to put a second layer of drywall with a closed-cell-foamish sound proofing layer between the two layers for even more sound reduction – we’ll see. So starting next week drywall should be going up pretty quickly. That will transform the house even more. 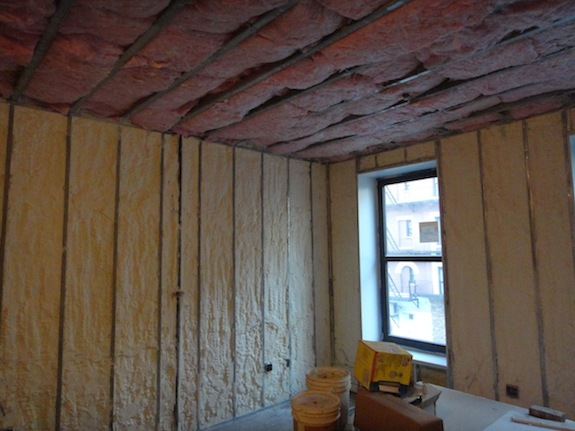 We’re using closed cell foam for insulation on all exterior walls and in the roof (which also has rigid foam). If you’ve ever been on a boat and seen foam cushions that have a smooth shiny surface to them – that’s closed cell foam. Open cell foam is more like a sponge. 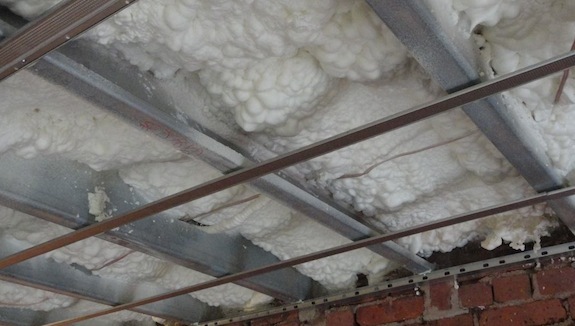 Closed cell foam doesn’t absorb water, but open cell foam does. Notice his note for a “continuous moisture barrier”. Basically “moisture barrier” is a fancy term for a sheet of plastic – there’s not much high tech about it. Well, when the contractor started framing the walls he didn’t put up the moisture barrier. 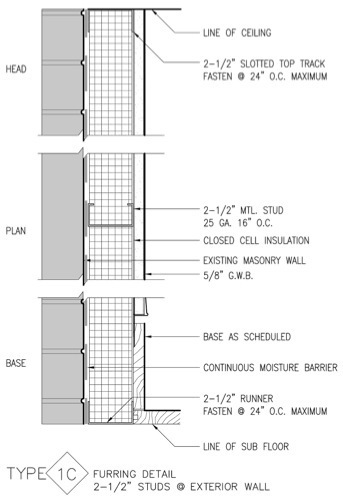 He hadn’t really noticed it in the drawings and on other projects the moisture barrier had gone on the inside of the studs – between the studs and the drywall. We tried to push back, but wound up giving in. Since closed cell foam is a moisture barrier we said he could skip the moisture barrier if he wanted to. Not putting the moisture barrier in has turned out to be a bad decision on the part of the contractor. He had the insulation subcontractor in today and she said the brick will absorb the equivalent of 1 1/2 inches of closed cell foam. So to get 2 1/2 inches of depth she has to spray 4″ of insulation (which means she’ll charge for 4″ of insulation). So word to the wise – if you’re using foam insulation, put a moisture barrier over your brick before you start framing the walls.